After adding printers in Restaurant Manager (see Adding printers), assign a printer template to each printer. Printer templates control the layout and functionality of print actions. For example, if you have two receipt printers and two kitchen printers, you must have two receipt templates and two kitchen templates, which are assigned to their respective printers. A printer in Restaurant Manager can also be to a virtual printer for emailing receipts and invoices. If you've created Email Customer and Email User printers, create a template for each printer. In Restaurant Manager, click Printers > Printer Templates. Choose a template or click Add Template. Name Create a name for the template. This is the function or purpose of the template. For example, if the type is set to Kitchen, assign the template to your Kitchen printer. 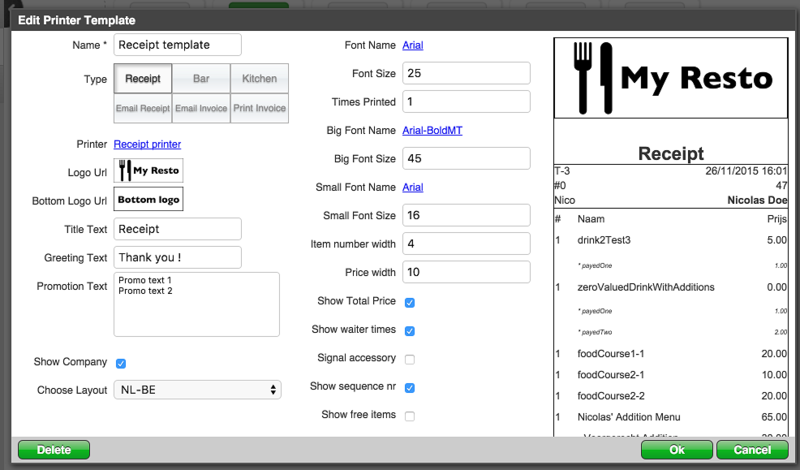 Kitchen: Set the template Type to Kitchen, and assign the template to the printer that is used by your kitchen to receive orders. Bar: Set the template Type to Bar, and assign the template to the printer that’s used by your bar to receive orders. Receipt: Set the template Type to Receipt, and assign the template to the printer that's used as your receipt printer. These templates function the same as the regular Bar, Kitchen and Receipt templates except that this text appears at the bottom of the receipt: "This is not a valid BTW ticket (dit is geen geldig btw-kasticket)". The finalized BTW receipt requires the Fiscal printer template (see below). Fiscal (Belgian FDM users only): This template is used for the official BTW receipt when a payment is finalized. This is a valid BTW receipt with the necessary FDM signature. To enable this type, first configure your FDM hardware and settings. Email Receipt: Set the template Type to Email Receipt, and assign the template to a virtual Printer that's defined as either Email Customer or Email User. Invoice: Customer invoices show the unpaid receipts on a customer's account. To create a printer template that will email invoices to customers, set the template Type to Invoice, and assign the template to the virtual printer that's defined as Email Customer. To create a printer template that will print invoices, set the template type to Invoice, and assign the template to the AirPrint printer. Full-page customer invoices can only be printed using an AirPrint-enabled printer. See Setting up Apple AirPrint. 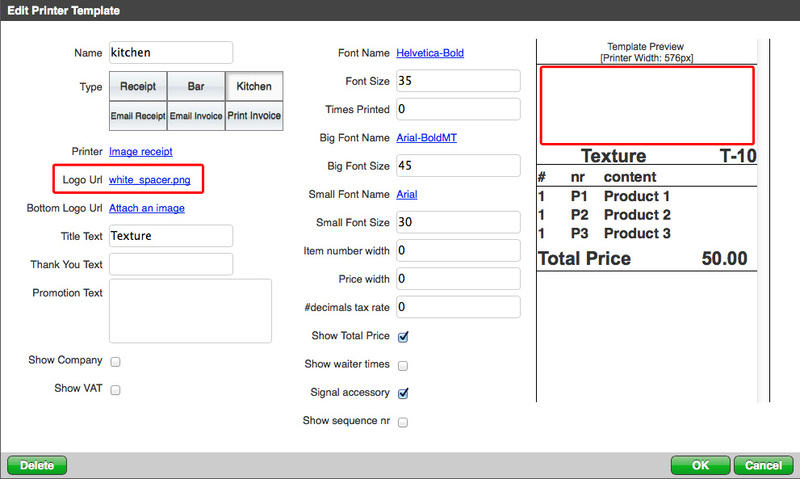 For instructions on how to print or email a customer invoice, see Creating customer invoices in Restaurant POS. Printer Assign the template to the corresponding printer (see Adding printers). Logo URL Upload the image you want displayed at the top of the ticket (recommended for receipts). For example, your company’s logo. Bottom Logo URL Upload an image to be displayed at the bottom of the ticket. Title Text Title displayed on your ticket below the logo (Putting your comapny name as the Title Text is recommended for receipts). Greeting Text Text displayed below the price (500 characters maximum). Promotional Text Text displayed below the Greeting Text (1000 characters maximum). Show Company Enable this to display company information, such as name, address, website, and VAT number. Assigns region-specific layout settings, tailored to local norms and currencies. Font Set the font used for items on the ticket. Font Size Set the font size used for the items on the ticket. Printed Copies Number of copies to be printed. Big font Font used for the Total Price and Title Text. Big Font Size Font size used for the Total Price and Title Text. Small font Font used for company information at the bottom of the ticket. Small Font Size Font size used for company information at the bottom of the ticket. Item Number Width Width of the column where the item codes are displayed. If you don't want to display the item number enter -1. Price Width Width of the column where the price is displayed. Show Total Price Enable this to show total price on the ticket. Show Waiter Info Enable this to show waiter’s name and time that the table was opened on the ticket. Signal Accessory Enable this if you have a device such as a buzzer connected to your printer. Show Sequence No. Enable this to display a sequence number on the ticket. Show Free Products If not enabled, products with a price of 0 are not printed on receipts. Show Free Modifiers If not enabled, modifiers with a price of 0 are not printed on receipts. Show VAT Enable this to show value-added tax (recommended for receipts). Linked categories For bar and kitchen printer templates you can assign categories to the template. See Assigning categories to printers. You may want to add extra white space at the top of tickets if using a railing in your kitchen or bar. To do so, you can either use the sample spacer image or create your own. In the Printer Template screen, click the printer template to modify. Click Attach an image for the Logo Url option. Choose the image to upload and click Upload. Select the uploaded image and click OK. The image is added to the top of the template. If you want to use our sample spacer image, save it to your computer and then upload it as the logo url.